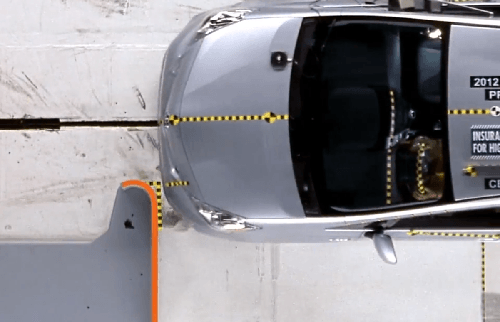 There is an important new type of frontal crash test. Here is why it is important to you and why the IIHS' Top Safety Pick + rating is the only one you should accept when buying a new vehicle. For many years the US government conducted crash tests. It still does. “Why?” is the real question . The Insurance Institute for Highway Safety (IIHS) does a much more rigorous set of testing and the automobile manufacturers are waiting in line to have their vehicle tested and approved so that they can post the IIHS “Top Safety Pick+” rating on their cars and in their advertisements. The frontal crash testing by IIHS is done at higher speeds, and in a way that is harder to earn a top score than the government test. Recently, the IIHS introduced a new front impact test, and it is important that you look for that + rating when you shop. Here is why. Last year the IIHS added a new frontal crash test that makes it harder for cars, crossovers and pickups to receive the top rating of Top Safety Pick +. The + is the new test. This test came about when Volvo and other sources began to notice that many of the deadly and serious accidents were when a vehicle hit something with the front of the vehicle, but only a small portion of the front of the car was able to absorb the impact. As many as 25% of serious crashes occur this way. A new test was developed and called the small overlap front impact test. It does not replace the older, moderate overlap crash test, rather it is an added test. In recent testing of 13 popular small crossovers the results were awful. Only one vehicle, the Subaru Forester earned a top score. Toyota actually bowed out of the test, afraid it would do poorly and asked for time to redesign the 2013 RAV4, a vehicle that has only been on dealer lots 2 months since a complete redesign. Like all tests, the manufacturers will learn to engineer the vehicles to earn a top score, but for now only a very limited number of vehicles have done acceptably well on the new test. The new test crashes a car at 40 MPH into a rigid barrier (simulating a tree or pole) and only 25% of the cars front structure is able to absorb all of that energy. What testing found was that even in cars with top scores on prior testing the car does not protect the driver. The crash test dummies miss the front airbag, and in many cases the car collapses and the dummy impacts the car’s hard points as they are pushed into it. This is all because the front protective structures of the car are not being impacted by the barrier. Rather, they are missed, and the barrier is able to easily crush the car and hurt or kill the driver. Manufacturers already have figured out that they need to add reinforcements that direct the crash energy into the center of the car’s protective “frame.” They just have not done so yet in almost all cases. For this reason TN recently recommended that buyers wait a few months before buying a model they are interested in and see if changes are made to it that might save their life in a crash. As you will see in the video, the new testing by IIHS is very thorough, and it is well worth looking for the + in the “Top Safety Pick +” top rating when shopping for a new vehicle.